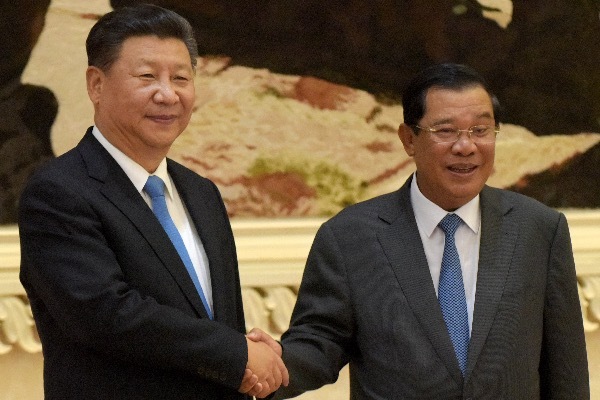 PHNOM PENH: Cambodia will not allow foreign military bases on its soil, strongman premier Hun Sen said yesterday, swatting away US concerns about a possible Chinese naval site near hotly contested seas. China has lavished billions of dollars in soft loans, infrastructure and investment on the poor Southeast Asian kingdom, providing Prime Minister Hun Sen with a fast growing economy that he wields as justification for his 33-year authoritarian rule. It has seeded disunity among the 10-member Asean bloc of Southeast Asian nations over a diplomatic pushback to Beijing’s aggression in the strategically pivotal South China Sea. Rumours a Chinese naval base is under construction off Cambodia’s southwest coast have been swirling. But in comments during a cabinet meeting, broadcast on Facebook live, Hun Sen denied military bases of any kind have – or will be – built on Cambodian territory. “I have received a letter from Mike Pence, US Vice President, regarding concerns that there will be a China naval base in Cambodia,” he said. The US, once the region’s undisputed military power, is acutely aware of the strategic and trading importance of the South China Sea and insists it remains international waters. US, Australian and British warships have increasingly conducted “freedom of navigation” operations through the sea to press that point, infuriating Beijing. “I will reply to the letter form US Vice-president Mike Pence to make him understand clearly about the issue,” he said. Several joint military exercises have also taken place while in June Beijing promised $100 million to modernise Cambodia’s military. “China and Cambodia are friendly neighbours… co-operation between the two sides is open and transparent,” Chinese foreign ministry spokesman Geng Shuang at press briefing in Beijing. “We are not and we will not seek hegemony or expansion,” he added, ahead of a summit of Southeast Asian leaders in Singapore. Cambodian PM: No China naval base being built 0 out of 5 based on 0 ratings. 0 user reviews.